Green Cow Power used a new macerator to more effectively process the organic material used in its anaerobic digester. Effectively running an anaerobic digester facility requires the right feedstock, processed the right way, to ensure maximum output. The operators at Green Cow Power in Goshen, Indiana, learned through trial and error how important the appropriate organic processing equipment is for running their operation. The large digester facility, which converts off-farm organic wastes and dairy manure into biogas and other byproducts, is the largest waste-to-energy facility in Elkhart County and the eighth largest digester operation in Indiana. Eighty percent of the waste that goes into Green Cow Power’s two Two-Stage Mixed Plug Flow digesters from Chilton, Wisconsin-based DVO Inc. is off-farm organic waste such as food processing and biodiesel processing waste, while the other 20 percent is dairy manure collected from five dairies within a three-mile radius. The digesters have a total combined capacity of 5 million gallons, and they accept three semitrailers full of manure each day. Prior to September 2016, Green Cow Power was using an organic grinder that was producing stringy waste, which hindered the efficiency of the digestion process. In order to get solid particle size that was more consistent (around 4-5 millimeters), the facility’s operators made the decision to switch to the RotaCut RCX58G from Germany-based Vogelsang. The Vogelsang RotaCut RCX58G is an inline macerator used on the suction side of the submersible pumps in Green Cow’s facility that feed the manure and organics mixture into the anaerobic digester tank. The RotaCut separates the heavy solids in the mixture, including a high volume of gravel and rocks, and drops them into a pit. The equipment’s screen then reduces the remaining material into particles of the required size. Before this new equipment was put into operation, Green Cow Power was using a twin-shaft grinder to reduce manure solids before they entered the pumping process. 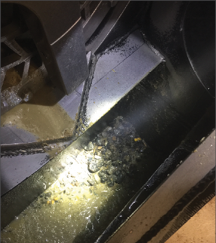 The high volume of the flow and inconsistent solid contents in the manure would routinely plug up the grinder, which caused it to need frequent servicing. Because of the design of this grinder, replacing the cutter stack and lower bearings was time-intensive and expensive, and rebuilding the cutter stack required aligning and shimming numerous blades and spacers, which could take hours. Additionally, the twin-shafted grinder was not designed to separate the heavy solids like rocks that get into the manure, which caused a litany of problems for the company. According to Derrick Parker, operations manager at Green Cow Power, the addition of the new macerator allowed the facility to better process and size materials than the equipment that was used before the upgrades. Parker says that the addition of the new macerator also helped to improve efficiency and prevent larger particle size organic waste from causing issues with the rest of the equipment. Parker says the facility receives 140,000 gallons of liquid manure, 100 cubic yards of dry manure and 150,000 gallons of organic waste products from food and biodiesel processors weekly—all of which is pumped through the RotaCut before entering into the digesters. Since there are no cartridge-style parts that have to be sent out for reconditioning or factory refurbishment with the company’s new equipment, system maintenance is more seamless. Vogelsang’s RCX model features a quick-release door, allowing Green Cow Power’s operators easier access to the cutting head. Additionally, since RotaCut screens are reversible, they allow for a fresh cutting surface without the addition of a spare part. Because of its design, routine service of the macerator, such as changing blades or flipping the reversible cutting screen, only takes a fraction of time required to service a typical twin-shaft grinder, according to Parker. “Maintenance has been pretty simple to date,” Parker says. “The overall design makes it easy to clean and access serviceable parts. Once a week, we open the access door and flush out any rocks and other debris that settles in the collection chamber. 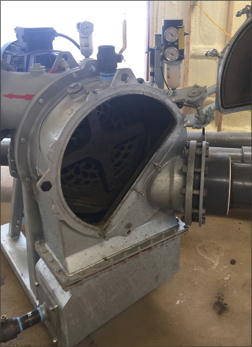 Additionally, the reduced material size from the grinder helps with the maintenance of our pumps downstream. Thanks to the investment in the new macerator, Green Cow Power is now better able to meet its energy needs. The digesters produce 630 standard cubic feet per minute of biogas and 2,200 kilowatts of electricity that is used in the local power grid. The digested liquids and solids are returned to the farms from which they came: The liquid is stored in lagoons to be used as a crop fertilizer, while the solids are used as cow bedding. Hot water that is generated in the process is used to power the digester. The building and development of Green Cow Power’s facility cost near $7 million when it was built back in 2015, but thanks to its output, the company expects to see a return on that investment in the next several years.